Boil rice noodles in salted water according to directions on packet, drain and stir in rice syrup. While they are cooking, stir fry vegetables in oil in a wok or pan. Tip vegetables out onto noodles. 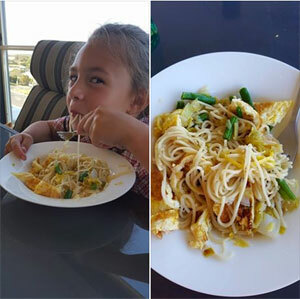 Pour beaten eggs into the same pan to make an omelette, roll up, cut and serve on top to noodles.